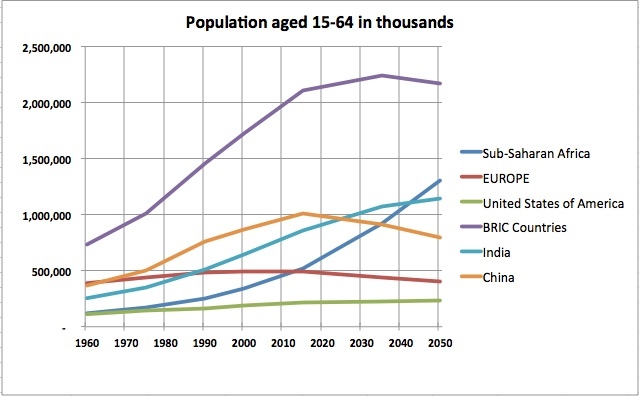 A fast growing economy usually requires a growing working-age population. 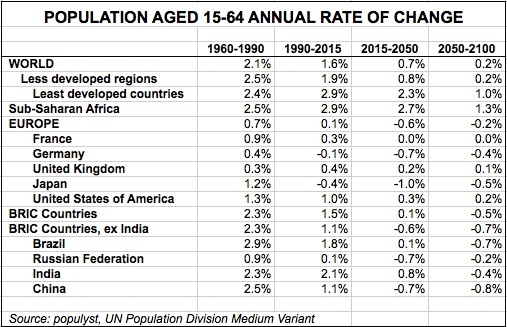 It is informative in this regard to look at the size of the working-age population (wap) for different regions and countries of the world. The wap of Europe, the US and Japan experienced healthy growth between 1960 and 1990. After 1990, it started to decline in Japan and to stagnate in Europe but it continued to grow in the US. Based on the UN’s ‘medium variant’ forecast, the wap of Europe will decline steadily for the rest of this century, from 492 million in 2015 to 405 million in 2050. Barring a massive inflow of immigrants or a sharp rise in the birth rate, France’s wap will flatline and Germany’s will fall by 23% in 2015-2050. The wap of the BRIC countries experienced strong growth until 2015, but it will be flat from here on. Only India’s wap will continue to grow. Brazil’s will be flat while China’s and Russia’s fall sharply. Last but certainly not least, the wap of sub-Saharan Africa will continue to boom, adding 800 million people in the next 35 years. Looking at the entire world picture, the wap will grow by 1.27 billion in 2015-2050, which is a slower rate of growth than in the past. The vast bulk of this addition will come from sub-Saharan Africa, India and a few other Asian countries. In the 25 year interval 1990-2015, the wap of BRIC countries grew by 650 million, driven by India, China and to a lesser extent Brazil. The question now is whether sub-Saharan Africa and India can translate their own booming wap into rapid and sustainable economic growth. With developed and BRIC countries slowing down, the world economy depends on it.